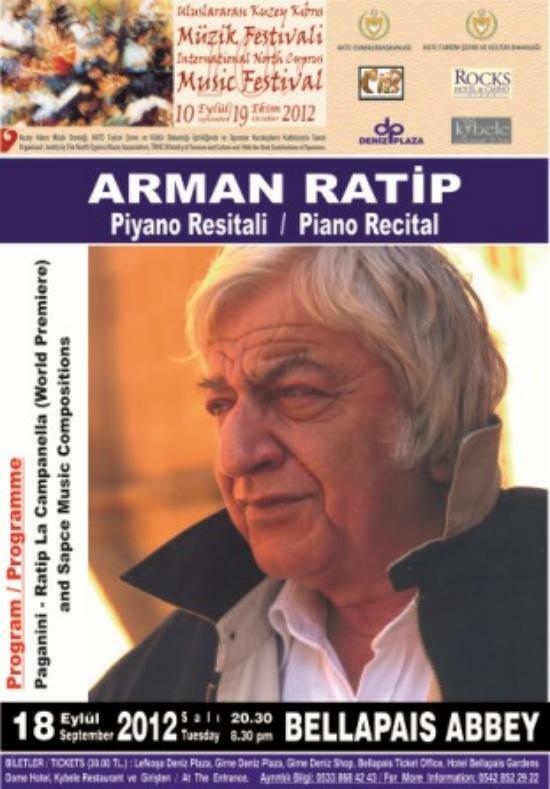 In continuation of this autumn’s music programme within the framework of the Music Festival, Arman Ratip will play for us on the piano The first part of the programme includes the world premiere of Ratip's own arrangement of Paganini's "La Campanella". and Jazz Sonata, another new work by the composer. In the second part, Ratip, who is well-known for his "Space Music"
compositions will perform Alpha Centauri, Sirius, Andromeda and Barnard's Star. It will be interesting for the reader to know about Arman Ratip’s life. I include here an interview I did with him in 2006. “Music is my world,” said Arman Ratip. “I was surrounded by it all my life. With every breath I took, I sucked in music.” His mother, Jale Derviş, one of the most famous music teachers on the island, introduced the young Arman and his sister to the piano when he was five. Two years later, he was playing his own compositions and has since produced two piano concertos and about 60 other pieces. Today he works in many categories of music for the 21st century, but in addition to this, there is avant-garde jazz and Turkish jazz, arrangements of Turkish folk, contemporary music and finally, romantic music. Arman met me in Nicosia in the Old City and took me to his mother’s home where he keeps his piano. There we sat close together, the three of us: the piano, Arman and myself with piles of photo albums on my lap which I excitedly leafed through. There were photos of his family from 100 years ago, photos of his mother playing the piano and of her teaching in class. He told me that everyone of his local generation who had had music lessons must have been under her wing. One photograph in particular intrigued me. It showed Arman's parents on a motorbike in 1939, both beautiful and modern. Now she is 94 years old. And with just two rooms separating us, she must have had her ears ringing with all the stories and love that flowed as he spoke of her. Arman got up and moved his piano stool to sit and play for me, a Paganini interpretation and a romantic song. “Oh, how in love I was when I composed that,” he exclaimed, as I sat and watched him, his face and body fully concentrated on the music he heard and gave me to taste. Where did his family live when he was a child? At the age of fourteen, Arman started to play jazz and as he was so popular, his talent was always welcome. He then went to London to stay with his father and to study – no, not music – but law, political sciences and finally journalism. Back on the island, Arman published the bilingual magazine PAN for 23 years. “I am a political animal. I had to show the world how proud I was to be a Turkish Cypriot; it was a kind of mission to report on our culture, our ways, our sports – by the way I am a keen supporter of our football club – to build up confidence, to say: look, we are here. Concerning the work on PAN, Arman paid tribute to his wife, who did all the computer work and the lay-outs, “I could not have done it without her,” he acknowledged. Another aspect of this multi-talented man is his writing. There were several thrillers that were never published, and he wrote the music for one of them The Spy from Istanbul. One of his published books was on backgammon. “I love playing, gambling, I love poker... one day someone will come and publish my work, my music and my books, I am hopeful for the novel I am working on. I will never stop working, I live through my work: composing, playing the piano, writing, I feel ageless. At tonight's concert in the Atatürk Cultural Centre, the Great Improviser will talk to us through his limitless improvisations.